“Stolitsa Nizhny” Group launches its new corporate website. On the 22d of March “Stolitsa Nizhny” Group opened its official website http://www.stnn.ru. In February, 2003, the new trade centre «Etazhi» was opened in the central part of Nizhniy Novgorod. It is oriented on customers with medium and high income. The Trading Centre «Etazhi» is situated on the crossing of Belinskaya and Vaneeva streets within 400 meters from Svoboda Square. In close vicinity to it large residential areas of the Nizhegorodskiy and Sovetskiy districts are located. Its total area amounts to 18245 sq. m and nearby there also is parking designed for 185 automobiles. The trade centre «Etazhi» turned out to be the first modern and prestigious Nizhny Novgorod complying the international standarts. The trade centre is provided with modern ventilation and conditioning systems, service and passenger elevators, moving stairways and the supporting system «Intellectual’niy Dom». The conception of the «Etazhi» is intended to be strictly divided on definite segments as its levels are laid out in the following way: The self-service store is situated on the ground floor of the building. The first floor includes the perfumery and cosmetics shop, the drugstore and several other stores specializing in the sale of different types of goods such as watches, books, interior items, toys, sunglasses and so on. The second and the third floors are a conglomeration of mono- and multibrand stores presenting to customers clothes, footwear and accessories of the worldwide known brands. On the forth floor there are companies whose businesses are beauty salon, baby goods, young people clothes, etc. There also the Game room for children is situated. The fifth floor is adopted to the restaurant «Tinkoff», and the sixth one is to the disco club and the cafe. Among the tenants of the trading centre the new trading conception was put into application. Every customer is able to become a card holder of the special charge customer and the VIP-card of the trading centre, providing its holders with great discounts on goods and services of more than 50 companies all over the city. The trading centre «Etazhi» has deserved a number of just rewards. In 2002-2003 it was admitted to be the best building in Nizhniy Novgorod by the results of the architectural rating. 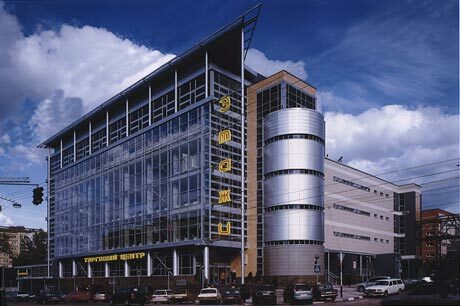 In 2003 in Sofia, Bulgaria, the trading centre was also awarded and presented with the gold medal and the diploma. It became the winner of several contests such as the National Logo and Brand Contest and the regional contests.